Two new Hatteland Display military products passed the U.S. Navy's stringent shock testing requirements designed to assess their suitability for the extreme Naval environment earlier in June. The MIL-S-901D Military Shock Test Specification is aptly nicknamed the 'hammer test', due to the fact that a large 'hammer' is used to strike the product being tested with extreme force. 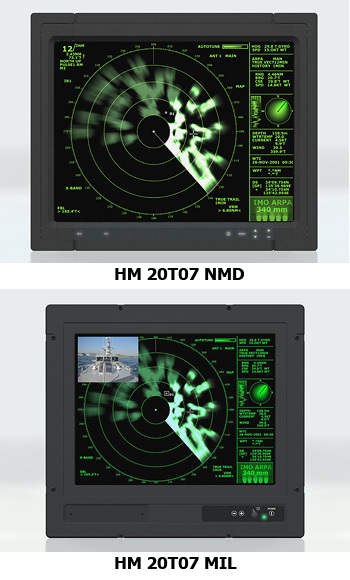 Hatteland Display's new HM 20T07 NMD and the HM 20T07 MIL naval displays both passed with flying colours first time around, which ensures that they qualify according to official standards for military use. The two units tested, both 20.1" TFT displays, passed the Grade A, Class I, Type A lightweight hammer test - which tests with a high-impact by dropping a weight from a certain height - without failures. This qualification test is required for hard-mounted naval ship board equipment and systems. It proves that the equipment will continue to function after a shock impact caused by conventional weapons close to the vessel. It also proves that the equipment will not harm personnel due to loose parts coming off during an impact. The test results show that despite the incredible force the displays were subjected to during the test, there was no visible physical damage or loss of functionality. "Shock resistance is vital in any marine display or computer but certain applications onboard a naval vessel require more extreme testing than usual," explains Brede Qvigstad, Director - Naval & Defence, Hatteland Display. "This shock testing proves the ability of our new MIL and NMD displays to withstand huge amounts of force and still continue to operate safely and we're delighted to report that they passed first time around." Hatteland Display military products are qualified to various standards including MIL-S-901D, MIL-STD-461E and MIL-STD-167. As a key supplier to the naval market it is vital that the company offers a lifetime commitment to its naval customers by supporting high-volume production with a worldwide logistics support network, and the ability to provide custom products and solutions. The shock testing is just one facet of this overall service that the company offers the navies of the world.